I am sure that we all welcome the initiatives that Dame Denise Coia has outlined. I certainly do. 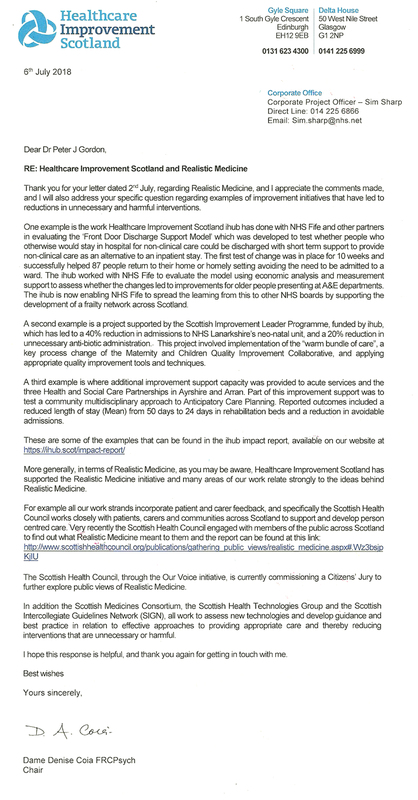 However, it is the case that the improvement work undertaken by Healthcare Improvement Scotland is based on IHI methodology – a reductionist approach that was developed in the engineering industry. It remains to be seen whether this approach can be used as a universal model for healthcare and whether it delivers the outcomes that really matter to people. I note that Dame Denise Coia has not responded to my open question on allocation of resources to the Institute for Healthcare Improvement, Boston, USA. If anybody has any thoughts on realistic medicine I would welcome them. Please add as comments below.